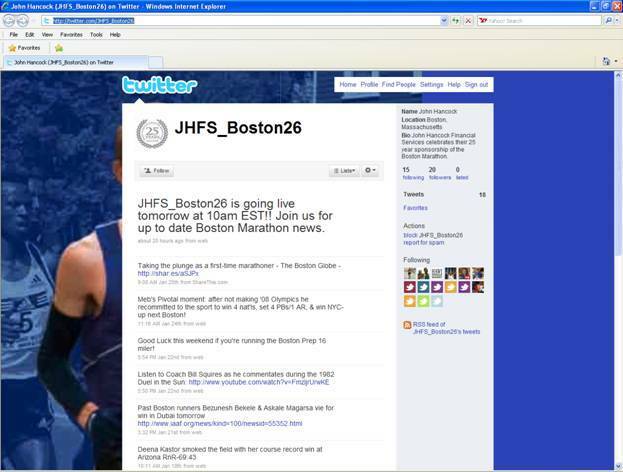 Yesterday John Hancock Financial announced it was launching a Twitter account (JFHS_Boston26) to support/celebrate this year’s race marking their 25th year as the principal sponsor. In this post we take a quick look at what can be done to enhance their effort. As soon as we saw JF’s twitter page we knew there was an opportunity to do more based on the background alone, but after reviewing the related online touchpoints by all involved parties we came up with a little longer list of suggestions. Branding: Should include the BM logo and event date on it. Should also include a 25th Anniversary note and JF’s logo on the columns. The icon image is ok, but that image should at a minimum be enlarged and placed top left. Imagery: The running image needs to be resized, and also some may take issue with that there are only male runners, so we would include a female as well. Overall it’s just very….unexciting. A proper design would give it life. Scheduled Twitterviews with Past Champions – Would be great to see some interaction with past champions like Bill Rodgers, Alberto Salazar, Robert Cheruiyot, Joan Benoit-Samuelson, Uta Pippig, Catherine Ndereba, etc. on scheduled days/time. Tactic like this might also work better in a live video setting like JustinTV. Training Countdown – Tied with a content partner to post a weekly training schedule countdown. Champions Countdown Background Strategy – With 25 days to go before this year’s race, they should change out the backgrounds on a daily basis to reflect winners from 24 years ago, 23 years ago – to pay tribue to each of the 25 years they have sponsored the race. We looked at what JF currently does on their own site around the BM, and we also looked at the official BM site. The JF site content is what you see from a lot of corporate event sponsors, they cover the basics of their sponsorship and leave it to the event official site to properly showcase in-depth content. Unfortunately in this case the BM site could be vastly improved (design and content). Interestingly we checked the Chicago Marathon site for comparison and it’s like looking at old school vs. new school. -Vote on Most Memorable BM in past 25 yrs. As fans of the Boston Marathon we applaud John Hancock’s ongoing financial support of the race, and their effort to setup a Twitter promotion around their 25th Anniversary. Our list of suggestions above is really only the tip of the iceberg for what they could add to their online activation, and in the future we hope they really take advantage of all the opportunities the online channel provides.